Dr. Greg J. Marchand Becomes First U.S. Surgeon to Receive Award "Surgeon of Excellence in Minimally Invasive Surgery"
PHOENIX, AZ--(Marketwired - November 03, 2016) - Dr. Greg J. Marchand, a board-certified obstetrician and gynecologist dedicated to reducing invasive surgeries, recently became the first U.S. surgeon to earn a prestigious accreditation for his outstanding record of performing and promoting minimally invasive procedures. The Surgical Review Corporation, an internationally recognized medical accreditation company based in North Carolina, named Marchand as the first U.S. "Surgeon of Excellence in Minimally Invasive Surgery" (SOEMIS). "I am very hopeful that the 'Surgeon of Excellence' program will bring more attention to minimally invasive surgery," the Mesa physician said. "Far too many women are being cut open for procedures that could be performed through minimally invasive means. I am honored to be the first to receive this distinction." Typically, the SRC and the American Association of Gynecologic Laparoscopists review medical facilities and designate the surgical hospital as a "Center of Excellence in Minimally Invasive Gynecology" (COEMIG). Past recipients have included Kaiser Permanente in California and Penn State Milton S. Hershey Medical Center in Pennsylvania. This is the first time, however, that a designation has ever been given to an individual surgeon. "We congratulate Dr. Marchand for his accreditation," says Ashley DuBray, SRC senior director. "To achieve SOEMIS accreditation, Dr. Marchand invited SRC to complete a rigorous onsite inspection and thorough chart review to illustrate his compliance with the program. Dr. Marchand and his practice exemplify SRC's commitment to patient safety and care." In contrast to typical surgical procedures, such as a traditional hysterectomy in which a woman's abdomen is cut open, the uterus removed and then the incision site sutured, minimally invasive techniques use thin needles, very small incisions and an endoscope to guide the surgical tools through the smaller openings. Trauma to the body and recovery time are both reduced with such surgical options, and patients often leave the hospital the same day as the procedure. Dr. Marchand's technique for hysterectomies is so refined that he holds a 2008 Guinness World Record with a partner for removing a 7-pound uterus laparoscopically in 2007. He is also extensively published in medical journals for his support of non-invasive techniques and his innovations in the field of minimally invasive surgery. 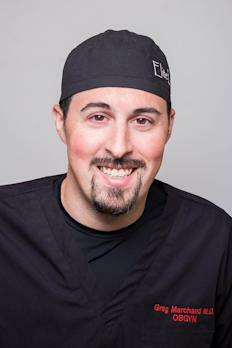 Greg Marchand, MD is board certified in obstetrics and gynecology, and a Fellow of the American College of Surgeons. He operates at six hospitals in Phoenix's East Valley. Marchand grew up in Rhode Island and completed a four-year residency in obstetrics and gynecology at the University of Tennessee in Memphis. He is extensively published in gynecologic minimally invasive surgery. Marchand is often featured in local media as a medical expert in gynecological health. Visit www.gregmarchandmd.com for more information about his practice.